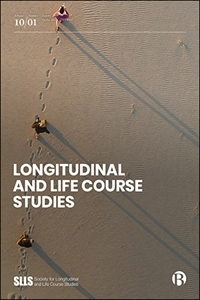 Longitudinal and Life Course Studies (LLCS) is a peer-reviewed journal dedicated to the needs of researchers studying the life course and using longitudinal methods at the interfaces of social, developmental and health sciences. It fosters cross-disciplinary and international endeavours and promotes the creation and exploitation of longitudinal data resources as well as their application to policy issues. As the journal of the Society for Longitudinal and Life Course Studies (SLLS) it provides an opportunity for scholars at all stages of their careers to publish work crossing disciplinary boundaries which is often beyond the scope of more conventional, single-field journals. Longitudinal research involves the follow up of individuals, households, communities or other groups over time. Life course study focuses on the influences that shape holistic pathways from conception to adult life and old age. LLCS brings together the broad range of specialist interests in an international, multi-disciplinary, multi-method framework . The Editors welcome submissions which report on research or methodological development, in one or more of these fields and from a spectrum of disciplinary approaches: sociological (quantitative and qualitative), demographic, economic, geographic, historical, psychological and behavioural, epidemiological and statistical. Typically papers deal with individual data in several domains (for example physical or mental health, education, housing, employment) as they change over time, and set in their life course and policy context. International comparisons are encouraged within papers and can be made between them. In addition to carrying research articles, the Journal specialises in publishing study profiles introducing particular longitudinal studies to scientific and policy users and the designers and managers of other studies It explores new forms of longitudinal data collection, including the exploitation of administrative sources. Occasionally, it also publishes edited debates and invited pieces about the research-policy interface, keynote addresses at SLLS conferences, and reviews of books of special relevance to our readership. The Editors seek to ensure that all research reporting is accessible to the journal's multi-disciplinary readership and encourage comparisons and collaborations between countries and studies. We are especially eager to showcase findings from parts of the world where longitudinal studies are increasingly being established, such as East Asia, Africa and South America. LLCS strives to maintain the highest quality in accepted papers through double-blind peer review, drawing on an international as well as interdisciplinary network of editors and reviewers.